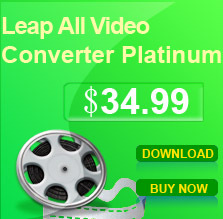 Leap WMV to AVI FLV MPEG MP4 MOV Converter is the best WMV video conversion software with easy-to-use interface, fast converting speed and excellent output video quality. It can help you convert your WMV file to many popular video formats such as WMV to MP4, WMV to AVI, WMV to VCD, WMV to SVCD, WMV to DVD, WMV to iPhone, WMV to Zune, WMV to FLV, WMV to SWF and WMV to MOV. 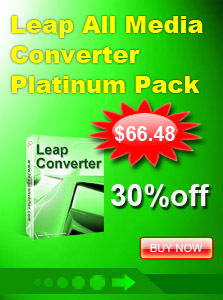 Leap WMV to AVI FLV MPEG MP4 MOV Converter makes it easy for you to enjoy WMV video with your MP4, iPhone, Zune player. Input formats: WMV video file. Output formats: MP4, AVI, VCD, SVCD, DVD, iPhone, Zune, FLV, SWF and MOV.